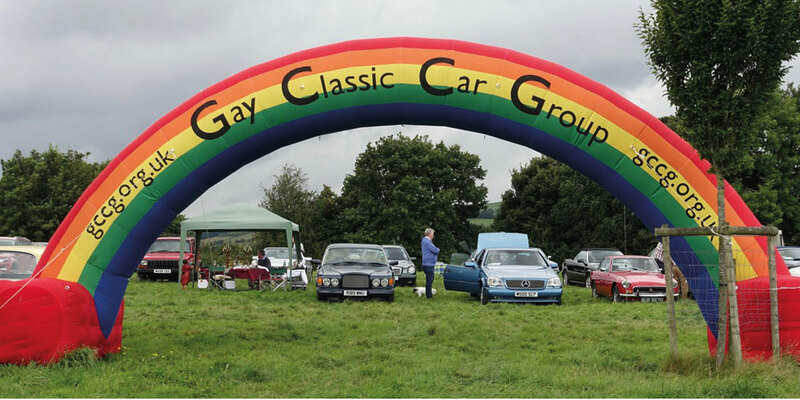 The Gay Classic Car Group is over 30 years old and has a membership of over 1000 LGBT enthusiasts with a passion for their motors. Darren Mitcham from the GCCG reveals some of their members’ special cars and their range of events and socials. The Gay Classic Car Group (GCCG) started informally in 1988 when a few friends met up at a pub in London. After a few more ad hoc meetings the first event was a 12 car London to Brighton run. In 1988 the classic car and gay world was a very different place. Since those early days and gentle growth in the 1990s, the GCCG has grown to over 1000 members. We have members from 18 to 80 and 35% of our members are in London and the south east. The GCCG offers a home to enjoy a friendly diverse mix of people and cars in a relaxed and inclusive atmosphere. Even though the GCCG is a primarily a UK national club we have very strong international links with our sister clubs in France, Germany, Holland, Denmark, Switzerland, USA, and Australia. At least twice a year we meet up with at least 100 people from mainly the European clubs for weekend events. The GGCG windscreen sticker can be seen on many cars at classic car shows, which shows how increasingly relaxed attitudes are to our existence. Indeed, many of the classic car press often contact us to find rare or unusual cars to review as they know someone in the club will own one and our members tend to love to share their passion. Members’ cars are increasingly diverse, but that adds to the enjoyment of coming on GCCG events. For example, you may see British favourites such as Morris Minors or Austin Metros through to eastern European forgotten brands such as Ladas or Trabants, or rare exotica from Rolls Royce or Daimlers. Indeed, you don’t even need to own a classic car to join and come on events. The GCCG offers an alternative, or a parallel, to single-marque club membership, providing a gay social experience in the context of a shared, and often very knowledgeable, interest in all classic cars. Single-marque clubs are social to varying degrees, but are often far more concentrated on the nuts and bolts workings of the cars. To put it another way, single-marque clubs provide a resource to help us maintain and learn more about our cars; the GCCG gives us an additional friendly environment in which to enjoy them. In summary, it is the common interest in these wonderful old cars that brings everybody together, gay or straight. The GCCG provides a lively, complementary way for gay and lesbian classic car fans to share their enthusiasm. The GCCG’s best event in 2018 was a weekend in Norwich which was attended by 240 members including visitors and some cars from Europe, America, and South Africa. The weekend started with a visit to the East Anglia Transport Museum outside Lowestoft. The star attractions were the restored trams and trolleybuses working on a live circuit around the site. 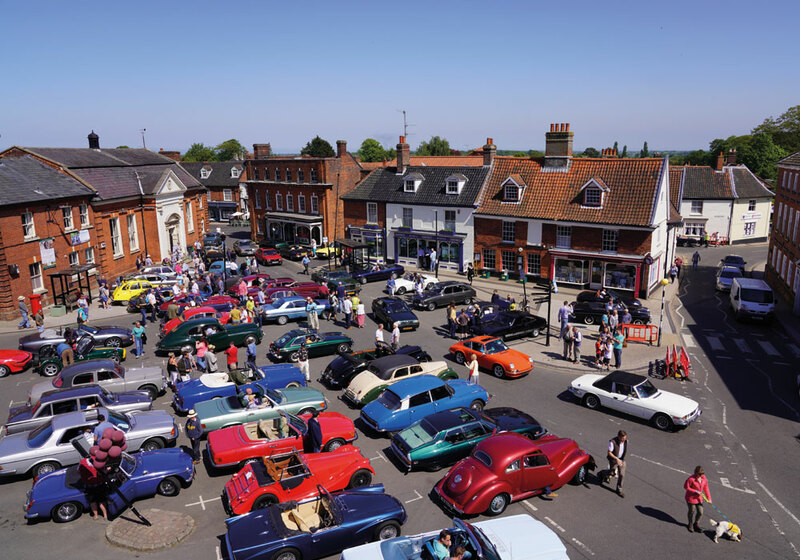 Following a splendid Saturday morning drive through the broads and a visit to the fascinating East Ruston gardens, the highlight of the weekend has to be the National Trust owned town of Aylsham, which was closed off to show 100 of our cars. As the GCCG is celebrating 30 years, the theme of the evening meal was emerald. Any car of a green hue was invited to display outside the dining marquee and most outfits featured some if not all green clothes. Sunday morning was an early to start to take in the delights of the Thursford Collection Steam Museum with impeccably restored engines and fairground rides. The centrepiece of the collection is a mighty Wurlitzer organ and during the summer season there are two half hour shows with a resident organist, Robert Wolfe, one of the world’s leading theatre organists. The organisers had thoughtfully arranged for Robert to perform a special concert for the GCCG. Of the various recommended routes for a driving afternoon, the most popular was the journey back to Dunston Hall followed via the lovely North Norfolk coastal village of Blakeney with its signature ‘flint’ cottages, pubs and hotels. As the weather was very favourable many stopped for a leisurely lunch of fish and chips. The weekend culminated in a second fancy dress dinner based around “a right royal wedding dinner”.